Miss Bates rarely ventures outside her romance reading enclave, but when she hears the siren call of another genre, it’s a crime novel she goes to. Laurie R. King’s The Beekeeper’s Apprentice, named one of the twentieth century’s 100 best mysteries by IMBA, has been in Miss B’s TBR pile forever. 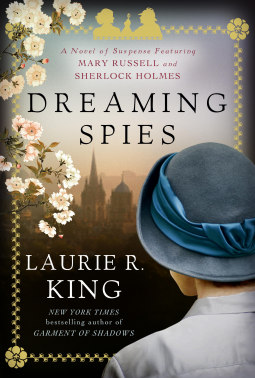 Dreaming Spies, with its detecting team of Sherlock Holmes and wife, Mary Russell, is 13th in the series. (Rats … now Miss B. has to go back to twelve more!) Amidst, like her friend Vassiliki, a super-busy near-non-reading few weeks, Miss B. managed to get through Dreaming Spies in dribs and drabs. But she must read, even when deadlines loom. As a result of this sporadic reading, often conducted in bed nodding over a gently glowing Kindle, Dreaming Spies‘ mystery receded into inchoate Miss B. head-mess (not to fault King, but Miss B’s weak focus and exhaustion) and what emerged into the foreground was Mary Russell’s first-person perspective, a wonderful use of first-person “voice,” and the things “not said” about her marriage to Holmes. Though Miss Bates doesn’t often indulge in blurb quoting, her hazy retention of plot details, in this case, necessitates it. After a lengthy case in India, Mary Russell and Sherlock Holmes are on the steamer “Thomas Carlyle,” bound for Japan. Though they’re not the vacationing types, Russell is looking forward to a change of focus – not to mention the chance of traveling to a place Holmes has not visited before. The idea of the pair being on equal footing is enticing to a woman who often must race to catch up with her older, highly skilled husband. Aboard the ship, intrigue stirs almost immediately. Holmes recognizes the famous clubman, the earl of Darley, whom he suspects of being an occasional blackmailer: not an unlikely career choice for a man richer in social connections than in pounds sterling. And then there’s the lithe young Japanese woman who befriends Russell and quotes haiku. Haruki Sato agrees to tutor the couple in Japanese language and customs, but Russell can’t shake the feeling that the young woman is not who she claims to be. Once in Japan, Russell’s suspicions are confirmed in a most surprising way. From the Imperial Palace in Tokyo to Oxford’s venerable Bodleian Library, Russell and Holmes race to solve a mystery involving a small book with enormous implications of international extortion, espionage, and shocking secrets that, if revealed, could spark revolution – and topple an empire. The blurb doesn’t do the novel’s complexity and pace justice. Firstly, Dreaming Spies has a lovely turning-in-on-itself framing structure: it opens in 1925 Sussex, moves dramatically to Oxford, a bleeding Haruki appearing in Mary Russell’s garden, returns to 1924 and their acquaintance aboard the Thomas Carlyle, becomes a stunning Japanese travelogue of places and customs as Holmes and Mary make their way from Yokohama to Tokyo, and returns to Oxford and the resolution to the mysterious book and its implications. Miss Bates loved the novel for how it wove an homage to the 17th century master-haiku-ist, Basho, into the narrative, using haiku as epigraphs to each chapter, for its portrayal of the “bright young things” shipboard characters, for the background of the Great War that surely never stopped haunting its survivors, for a gem of a scene with Japan’s Prince Regent, later the Emperor Hirohito, and for the cryptic love between its detecting protagonists. Crime and romance novel are linked in how they reveal something and have a similar end in the re-ordering of the world into a better place. But their compass needles point in different directions: the crime novel toward justice; the romance, towards love. Both are concerned with a world remade in truth, in genuineness, of social order in the one and cohesion in the other. Taken together, what more could we ask of the world than justice and love? But their needles make for different narrative arcs and, like the appearance of a dot of light and dark in the Taoist yin-yang symbol, the hint of romance in the former and mystery in the latter are a fictive way of portraying the complexities of revelation. While Miss Bates enjoyed Dreaming Spies‘ many literary aspects, she was fascinated, as a romance reader, by the elliptical nature of Mary and Sherlock’s marriage. (She thought it telling that readers have begged King to write their wedding scene and she is adamant in not doing so, as Miss Bates found out from King’s website.) For the nature of crime fiction is the bringing to justice of a world whose equilibrium has been upset by wrong; and the nature of romance fiction is the bringing about of the world’s renewal by the hope of new life as created by love (which is why Miss Bates defends the baby-filled epilogue, no matter how trite). Miss Bates thinks, like the elusive meaning of the yin-yang, we may find a smidgen of romance in the crime novel and a hint of justice in the romance. I retired to a deckchair with my book. Holmes glowered down at the teeming dock-side below. I pointedly kept my eyes on the pages. “Yes.” He drew out the word. I was not surprised when it was followed by the sound of his cigarette case clicking open. I sighed, and let the book fall. There are drawbacks to having a husband with a restless mind. Other than the scene’s sheer delight, Miss Bates was enamoured of Russell’s love of books and how they served as her armour against her husband’s “sharp mind,” a refuge, a cocoon, but not an escape. Mary loves books and resents anything that takes her away from them. But she loves Holmes too and knows when he needs a sounding-board. Rueful tolerance, alliance, and companionship, the stuff of the post-HEA, or as Mary spectacularly says, in Buddhist and Christian terms, “my own partner on the Way”. Miss Bates loved having her exclusively romance diet experience a palate-refreshment in Laurie R. King’s Dreaming Spies. But, in the end, the most enjoyable aspect was the romance, albeit a subtle, understated one. The working out of the drawn out mystery plot was something she could leave behind … which she did, when she quit the mystery novel. She’s drawn some broad and most likely not terribly accurate generalizations, so if you’re fan of the series, share your thoughts about it in the comments. Miss Austen, who herself was a fan of elliptical romance, would’ve enjoyed King’s novel and deemed evidence of “a mind lively and at ease,” Emma. Laurie R. King’s Dreaming Spies was released on February 24th by Bantam Dell Books and is available in “e” and paper formats at your preferred vendors. Miss Bates is grateful to Bantam Dell for an e-ARC, via Netgalley. I see an end in sight for our busy schedules, Mis B. And then we will be like children in Lollipop land. Fun! Joy! And lots of reading! Yes, whole, glorious weeks of lolling and reading! I do remember that I loved the first ultimate meeting of minds, where each learns from the other, (despite the genius-ness of one), then the secondary and VERRY slow burn romance. It always seems like a truer partnership than many of the Sherlock reiterations that seems to abound at the moment; that the positive and not-so-positive tendencies in one half, were not just balanced by their counterpart, but were understood and given space. I feel a binge re-read coming on! Ooh!! I LOVE The Mary Russell series even though I’ve read just the first in the series!! And yes, I love how in the very first book the foundation for the Russell-Holmes relationship is laid. I imagine it would be a whole lot of fun to watch that relationship mature and deepen over time! I’m most excited to dig The Beekeeper’s Apprentice out of my TBR and so looking forward to the 13 I can relish at leisure. I loved the rivalry and meeting of minds of the two protagonists and I love how they “tolerate” each others’ quibbles. But the love shines through as well … there are some marvelous moments which I left out of the review b/c, well, it would’ve been even longer. There’s a great scene where Holmes has to put on some tight-fitting Japanese clothes and Mary takes a long look at him and how great he looks, there’s such a spark of physicality in the scene! Then, Russell says to him, “That’s just not fair!” ’cause her outfit doesn’t look as good. Healthy, rueful rivalry and attraction after 12 books of marriage, pretty good, I say! I was fortunate enough to attend a reading/talk by Ms King, wherein the age difference between Holmes and Russell was addressed. The author said she had no problems with it at all, as she herself had married a man 30 years her senior and it worked just fine! Coupled with other remarks she has made over the years re: Holmes’ age, I have no trouble picturing him as 55 to Mary’s 25. As with any series the quality of the stories varies from book to book–I’ve read them all and enjoyed most, with ‘Justice Hall’ being my favorite (though it is a very fraught story–keep the tissues handy). I’m really looking forward to reading the rest of the series and I have so many to enjoy as I am a late-comer/convert. I’m especially looking forward to Justice Hall now I know it’s your favourite! I am glad you enjoyed this. Your comments about the relationship between Holmes and Mary are spot on. I read the series for those small glimpses of their private life (as well as the adventures/mysteries). I envy you the chance to read these books for the first time. I really should go back and do a re-read. (The usual warning applies, of course: The books will appeal, more or less, depending on one’s tolerance for the plot and the secondary characters: Holmes and Russell are always excellent.). Phew. Thank you so much for that “spot on”: I felt like I was romance-commenting in the dark, so to speak. But I loved those “glimpses” you speak of and the wit, oh the wit, that comment about books, and some social skewering were wonderful here. It’s just such a delight to find the comfort of a long-running excellent series, even when individual books vary in our enjoyment. This is wonderful! I’ve often wondered about those HEAs in romance after the thrill of the chase is over and the couple settle down to their mundane and routine life together. Like you, I love the ‘sound and fury’ of romance, but everyday life isn’t all champagne and roses. This passage speaks to a more enduring happiness and contentment. I’ve been a fan of those Sir Arthur Conan Doyle books since I was knee high to a grasshopper and, of course, watched each and every episode of The Adventures of Sherlock Holmes with the fabulous Jeremy Brett so I’m really looking forward to starting this series. Interesting that Laurie King incorporates other fictional detectives and mystery writers like Lord Peter Wimsey who makes a cameo in the third book, A LETTER OF MARY, and Dashiel Hammet who appears in #8 LOCKED ROOMS. Reading about the background of the series and your wonderful review has me itching to begin it NOW. I think it’s great how she weaves characters in from Doyle’s books like Sherlock’s brother, Mycroft; Mrs. Hudson, Sherlock’s housekeeper; and Mr. Watson. All of these are excellent reasons to snap my fingers at a TBR threatening to take over my world, but the best part that turned up in my research was a quote attributed to Laurie R. King who describes Mary as “what Sherlock Holmes would look like if Holmes, the Victorian detective, were (a) a woman, (b) of the Twentieth century, and (c) interested in theology.” Pretty cool, I think! Thanks for yet another great review and book recommendation. There were so many gems to the book: King’s is a sharp wit and fine mind. There were some wonderful little quips about “the world is too much with us” that I think you’d going to enjoy much. Yes, the post-HEA world of Russell-and-Holmes is pretty wonderful: tea, books, and adventure. But those little hints of romance, attraction, desire, affection, and tenderness are all the richer for the mundane and serene life they share. Your VW novel sounds ick, if you don’t mind me saying so. I HATE the infantilizing of the heroine and it’s not only Ye Olde Skoole romance that does that … it is, sadly, all too often found in the contemporary romantica. I am afraid you lost me at “detecting team of Sherlock Holmes and wife, Mary Russell”. You’re not a Holmes fan? I’ve barely read any Conan Doyle. I don’t mind Holmes, though it’s years since I read it. But ‘and wife’? NO. I’ve read next to nothing of Holmes … I think just Sign of Four? When you decide to tackle THE BEEKEEPER’S APPRENTICE (sorry, I forgot how to do the italics), please let me know. I own it, and I’ve been wanting to read it for a while. I’d love to share our impressions as we read! King has written some wonderful contemporary books as well – the Kate Martinelli series (cop in San Francisco), and Folly is my favourite (woman recovering from mental illness), also love Keeping Watch (mentions child abuse which is usually a no no for me, but she handles it in such a way that I can read it). Folly was actually recommended to me by a therapist and was the first King book I ever read. Devoured all her contemporary ones, then went on to the Russell/Holmes series.